Location: Jixi City is located in the southeast of Heilongjiang Province, sharing a boundary line of 631 kilometers (392 miles) with Russia in the east and southeast. Its city proper is seated at the west foot of Jiguan Mountain. History: Thousands years ago, this area was inhabited by ancestors of the Manchu. They fishing and hunting for life. By the Shang Dynasty (16th - 11th century BC), dwellers here had began to communicated with people in Central Plain. It was in the Han Dynasty (206BC-220AD) that primitive agriculture in this region had made a great progress. Physical Features: The city is surrounded by mountains in northern, western and eastern sides with the Musuo River flows through the city southwest to northeast, forming a spacious hoof-shaped basin. Low mountainous and hilly areas constitute the main landform of the city, together with plains and valleys along the rivers and lakes. 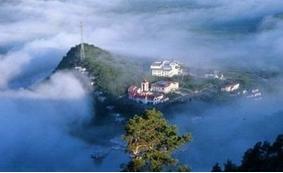 Climatic Features: Jixi enjoys a cold temperate continental monsoon climate, bearing an annual average temperature of 4.7C (40.5F). Due to the influence of the oceanic climate, winter in Jixi is warmer than any other cities around the city, praised to be the 'spring city in North China. When to Go: Jixi has a cool summer that is said to be the best time to visit the city. Khanka Lake is a boundary lake with its northern part belonging to China and southern part belonging to Russia. It was formed by the sinking of the earth's crust caused by eruption of a volcano. Except long and chilly winter, the lake favorable for visiting at the rest time of a year. Red-crowned cranes, mews, swans and egrets are regular callers of the lake.